Mustang 1994-1996 ABS Diag Info. Preface: Why I upgraded to the M2300K Cobra brakes and Mustang ABS. My old brakes scared the hell out of me! One day, I was following another car on the Lowell connector. I don't know how fast we were going. However, we were going "at a good speed". :-) The car in front of me decided to slow down for the 495 S exit. The NERVE of him. ;-) He slowed down at a very reasonable speed. I would have waited longer to start slowing down and tried to slowed down at a faster rate. The POS '86 GT brakes (new rotors, drums, pad, shoes, etc) did squat! I was "STANDING" on the brakes and I aws still gaining on the car in front of me at a fast rate. YIKES! HEY DUDE, I'm driving an '86 Mustang that has POS brakes, SPEED UP!!! I think dragging my foot on the ground (like Fred Flintstone) would have been more effective. Thankfully, the car in front speed up around the exit and my heart rate went down below 200. Hmm, death or $3K-$4K+ for brakes that work. YOU MAKE THE CALL! This is a VERY quick dump how to debug Mustang ABS problems taken from Mustang message boards. A more formal version will follow "one of these days" :-). My rule#1: ALL problems with ECC and ABS, **must** first have the error codes read. Otherwise, you waste your time guessing. It's ~$30 for an ECC reader and free for ABS codes. If you get a code "78", the problem is probably with the different size tires. *ANY* error, and the ABS is disabled. 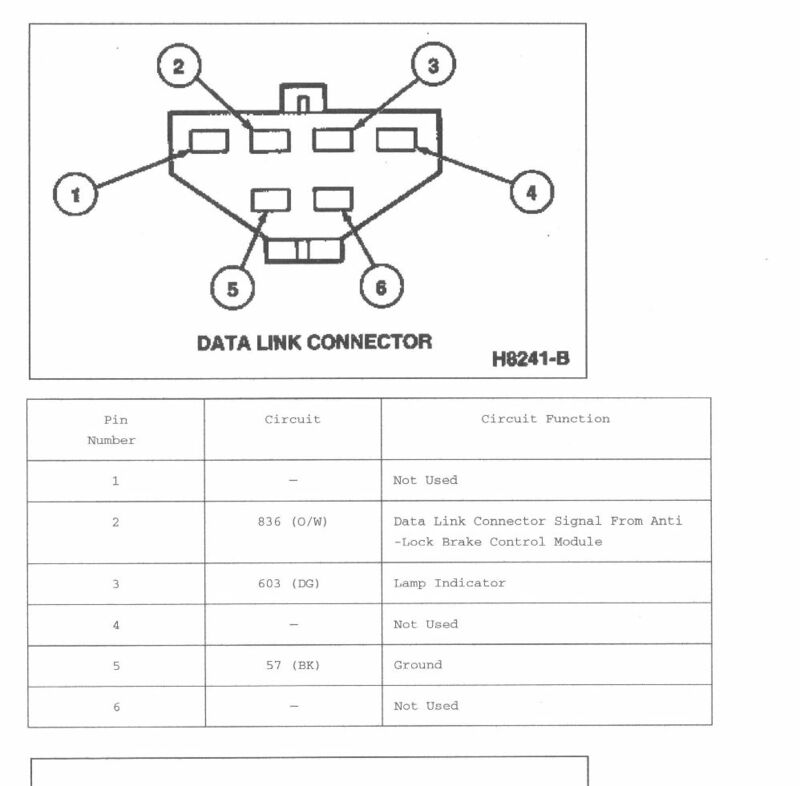 Here is a diagram of the ABS diagnostic connector. article that describes the installation of ABS into a fox (pre 94) Mustang. If all is ok, when you turn the ignition key to "on" the ABS indicator light will come on for a few seconds, and then go out. If it stays on, then the power-on diagnostics have detected a problem. To read the error codes out of the ABS unit, you ground the Orange/White wire at the ABS diagnostic connector (with the ignition turned off), and then turn the ignition key to "on". The ABS indicator light will flash the number of times to indicate the first digit of the first error code, followed by a short pause, and then flash the number of times to indicate the second digit of the first error code. There will then be a longer pause, then it will repeat for the second error code, and so forth. The ABS unit holds the error codes in memory for a certain number of power-on/power-off cycles even if the problem has been corrected. This messed me up trying to hunt down problems that weren't there. So, as long as the indicator light goes out after a few seconds following ignition-on, the system is fine, even though you can still read error codes out in diagnostic mode. The comments in ()'s are MINE are used to *only represent* an *idea* of what MAY cause a specific error. Action To Take: Go to Pinpoint Test F.
Disconnect 4-pin and 15-pin connectors at ABS unit. Remove instrument cluster. Refer to �Section 13-01�. Measure resistance between Pin 5 of the 16-pin connector and ground. Is resistance less than 5 ohms? Yes: SERVICE short in Circuit 603 (DG) wire to ground. FYI: Mustang ABS units can be hard to find and go for ~$250 -> $300 from a salvage yard. Or, for under $100 on ebay (when offered). You may want to double check with a Ford dealer before you spend a lot of money. 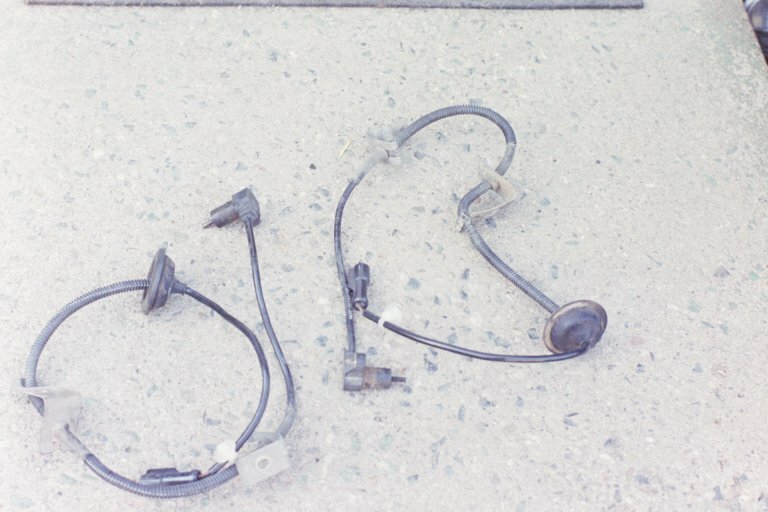 The good news: The electronic portion of the ABS can be replaced without disconnecting the hydraulic unit and the brake lines. 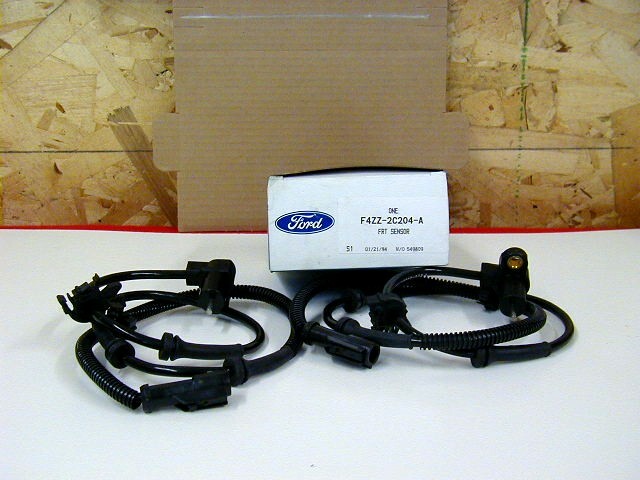 You can also buy a new electronic ABS portion from Ford for $$$$$. Look at it as Four parts: Sensors (most vulnerable), Rings (pretty strong), electronic control portion (it's electronic), hydraulic control portion (dirty cruddy contaminated brake fluid is it's enemy). The primary and secondary (front and rear) hydraulic brake systems are individual systems and are bled separately. Bleed the longest tube first on the individual system being serviced. During the complete bleeding operation, DO NOT allow the brake master cylinder reservoir to run dry. Keep the master cylinder reservoirs filled with High Performance DOT-3 Motor Vehicle Brake Fluid C6AZ-19542-AB or DOT-3 equivalent meeting Ford specification ESA-M6C25-A. Never reuse brake fluid that has been drained from the hydraulic system or has been allowed to stand in an open container for an extended period of time. Note: Non-ABS vehicles have the brake master cylinder mounted at an angle. Bleeding may be better performed if the vehicle is positioned so the brake master cylinder is horizontal. 1. To bleed the brake system, position a suitable box wrench on the bleeder fitting on the brake wheel cylinder. Attach a rubber drain tube to the bleeder fitting. The end of the tube should fit snugly around the bleeder fitting. 2. Submerge the free end of the tube in a container partially filled with clean brake fluid and loosen the bleeder fitting approximately three-quarters of a turn. 3. Have an assistant push the brake pedal down slowly through its full travel. Close the bleeder fitting; then return the brake pedal to full-release position. Repeat this operation until air bubbles cease to appear at the submerged end of the bleeder tube. 4. When the fluid is completely free of air bubbles, secure the bleeder fitting and remove the bleeder tube. 5. Repeat this procedure at the brake wheel cylinder on the opposite side. Refill the brake master cylinder reservoir after each wheel cylinder is bled and install the master cylinder cap and gasket. Make sure the diaphragm-type gasket is properly positioned in the master cylinder cap. When the bleeding operation is completed, the fluid level should be at the MAX line to 4.0 mm (0.16 inch) below MAX line. 6. If the primary (front brake) system is to be bled, repeat Steps 2 through 5 at the RH front brake caliper and ending at the LH front brake caliper. Bleed the brake master cylinder at the bleed screw after all calipers are bled. 7. After disc brake service, make sure that the disc brake pistons are returned to their normal positions and the shoe and lining assemblies are properly seated. This is accomplished by applying the brake pedal several times until normal pedal travel is established. For pressure bleeding, use a bladder-type bleeder tank only, such as the Rotunda Brake Bleeder 104-00064 or equivalent. Bleed the longest tubes first on the system being bled. The bleeder tank should contain enough new brake fluid to complete the bleeding operation. Use High Performance DOT-3 Motor Vehicle Brake Fluid C6AZ-19542-AB or DOT-3 equivalent fluid meeting Ford specification ESA-M6C25-A for all brake applications. Never reuse brake fluid that has been drained from the hydraulic system. The pressure bleeder tank should be charged with approximately 69-206 kPa (10 to 30 psi) of air pressure. 1. Clean all dirt from the brake master cylinder filler cap (2162). 2. CAUTION: To prevent system damage, never exceed 344 kPa (50 psi) pressure. Remove the brake master cylinder filler cap. Fill the brake master cylinder reservoir with the specified brake fluid. Install the pressure bleeder adapter tool to the brake master cylinder and attach the bleeder tank hose to the fitting on the adapter. Follow the instructions of the manufacturer to install the adapter. 3. 4.6L only - Bleed brake master cylinder as described. 4. If the rear disc brake calipers are to be bled, start with LH rear disc brake caliper and attach bleed tube snugly around wheel cylinder bleeder screw fitting. 5. Open the valve on the bleeder tank to admit pressurized brake fluid into the brake master cylinder reservoir. 6. Submerge the free end of the tube in a container partially filled with clean brake fluid and loosen the wheel cylinder bleeder screw. 7. When air bubbles cease to appear in the fluid at the submerged end of the bleeder tube, close the wheel cylinder bleeder screw. Remove the tube. Replace rubber dust cap on bleeder screw. 8. Repeat Steps 3 through 6 at RH rear disc brake caliper. 9. Attach a bleed tube to front brake caliper wheel cylinder bleeder screws and repeat Steps 4 through 6, starting at the caliper with the longest brake tube and ending with the shortest tube. 10. After all calipers have been bled, bleed the brake master cylinder using bleed screws on brake master cylinder. 11. When the bleeding operation is completed, close the bleeder tank valve and remove the tank hose from the adapter fitting. 12. After disc brake service, make sure disc brake pistons are returned to their normal positions and the shoe and lining assemblies are properly seated. This is accomplished by depressing the brake pedal several times until normal pedal travel is established. 13. Remove the pressure bleeder adapter tool from brake master cylinder. Fill the brake master cylinder reservoir. Install the brake master cylinder filler cap. Service or replacement to the ABS valve block or pump and motor assembly does not require any special bleeding procedure. Follow manual or pressure bleeding procedures. The anti-lock brake sensor electrically senses each tooth of the anti-lock brake sensor indicator as it passes through the anti-lock brake sensor's magnetic field. This data is sent on to the anti-lock brake control module. The anti-lock brake control module monitors the frequency created when the anti-lock brake sensor indicator teeth pass the anti-lock brake sensor to determine wheel rotational speed. 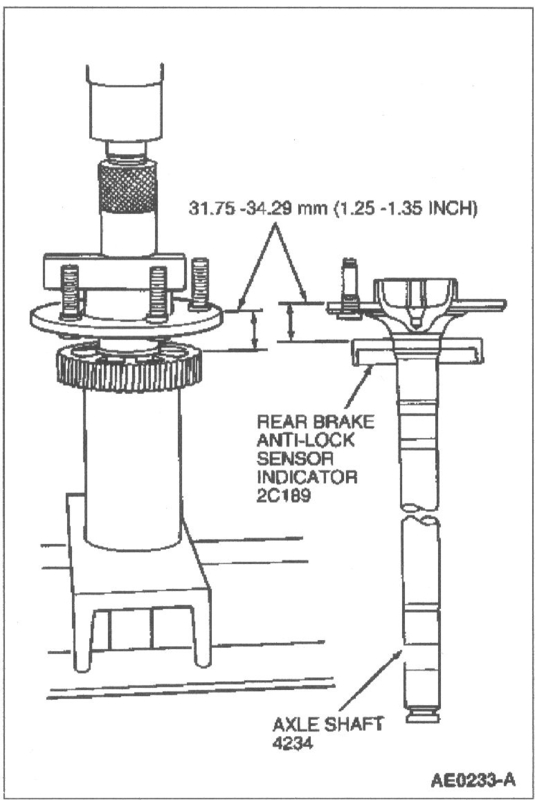 The front brake anti-lock sensor (2C204) is attached to the front wheel spindle (3105). The front brake anti-lock sensor indicator (2C182) is part of the wheel hub (1104) assembly. The front brake anti-lock sensors are not adjustable. The rear brake anti-lock sensor (2C190) is attached to the rear disc brake caliper anchor plate (2B582). The rear brake anti-lock sensor indicator (2C189) is pressed onto the axle shaft (4234). The rear brake anti-lock sensors are not adjustable. The anti-lock control module also has on-board diagnostic capabilities and stores diagnostic trouble codes (DTCs) in its memory. If a fault is detected in the system, a DTC will be stored in the anti-lock brake control module memory, and the instrument panel ANTI-LOCK warning indicator will illuminate when the engine is running. The anti-lock brake control module has the ability to store three DTCs in memory. When the anti-lock brake control module detects an impending wheel lock, it modulates brake pressure to the appropriate brake caliper. The anti-lock brake control module receives wheel speed readings from each brake anti-lock sensor, and uses this information to compare wheel speeds. By continuously monitoring and comparing the rotational speed of each wheel, the anti-lock brake control module activates the anti-lock braking system only when it senses an impending wheel lock-up under severe braking conditions. The anti-lock brake control module decides which brakes need to be controlled, and sends the appropriate signals to the Hydraulic Control Unit (hydraulic portion of the assembly). Impending wheel lock conditions trigger signals from the Hydraulic Control Unit that open and close the appropriate modulator solenoid valves. This may result in moderate pulsations in the brake pedal when applied. During normal braking (non-ABS stop), brake pedal feel will be the same as a vehicle with a standard brake system (non-ABS). The ABS hydraulic control unit and anti-lock brake control module are a complete assembly. The assembly is located in the RH lower front corner of the engine compartment, below the air cleaner. The unit is mounted inside a bracket, which is affixed to the RH frame rail. The hydraulic portion of the hydraulic control unit modulates brake pressure at each wheel through the use of six internal solenoid valves. A brake fluid pump motor recirculates the brake fluid during ABS cycling. CAUTION: General repair precautions should be observed when repairing and diagnosing the anti-lock brake system. Failure to do so may result in component damage. o	Do not disassemble any component which is designated as non-repairable. Some components must be replaced as an assembly. o	Never connect or disconnect the anti-lock brake control module connector with the ignition switch in the RUN position. o	When replacing the anti-lock brake control module or hydraulic control unit (HCU), insure that the spring plate is in proper position. Note: The anti-lock brake system (ABS) contains on-board diagnostics that can be accessed with New Generation STAR (NGS) Tester connected to the data link connector (DLC) located beneath the instrument panel. There are diagnostic trouble codes (DTCs) to assist with troubleshooting. DTCs can only be retrieved using the NGS Tester through the DLC. There are no provisions for flash code diagnostics. o	Prevents wheel lock-up during an emergency stop by modulating brake pressure. o	Permits the driver to maintain steering control and stop the vehicle in the shortest possible distance under most conditions. o	Activates with varying brake pedal force to engage the ABS function depending on the road surface conditions. A dry surface requires a higher force, while a slippery surface requires much less force. o	The driver will sense a pulsation in the brake pedal (2455) during the ABS operation. o	The pedal effort and pedal feel during normal braking are similar to that of a conventional power brake system. I should also mention to make SURE that the ABS unit has good battery power, *ignition power*, and grounds. Check fuses!! The article has the wire colors for the connections. Make sure that the ground wire that connects to ("hangs off) the bottom of the ABS unit is still connected. This wire is near where the power wires enter the unit. Most problems are broken sensors because of stones, etc. The sensors (not the rings on the axles/hubs) are easy to replace (also ~$70 ouch!). One bolt - very little torque to take off and put on. The sensors come with the wires and the strain relief supports molded in. The sensors and wires then just plug in to an easy to release connector. The electronic portion is also an easy replacement (although in a non fun to reach location). A broken ABS ring on the front is just a replacement of the hub (~70 each?). A broken rear sensor ring, well, read above. A bad hydraulic portion is similar to a master cylinder replacement. Here is a picture of the Front sensors and the attached wiring harness . Here is a picture of the Rear sensors, the attached wiring harness, and the associated brackets . The brackets are NOT part of the sensor and wiring harness that you buy. The Mustang ABS units can be bleed manually the same as a non ABS car. Sensors are ~$70 from the dealer and I'd guess ~$30-$40 if you can find one at a salvage yard. The sensor bolts on with a bolt that has a 12(?) point head. Just use a regular metric socket that fits (it works :-). The bolt takes VERY little torque. For space reasons, you must use 1/4 drive. When you put the bolt back one, use lock-tite. The rear sensor bolts onto the rear plate, the attached wire then bolts to that bracket on the Lower Control Arm, the wire then gets held by a bend-over clamp that is on the front of the rear wheel well, and then the wire goes through a rubber grommet (part of the sensor & harness) that ends up under the rear seat. Under the rear seat, there is about 1-2 feet of wire that ends in an easy to release connector. That is the sensor and wiring harness that you buy. The 2 rear sensors connect to a wiring harness that then goes to the front of the car and to the ABS unit. Here is a picture of the rear sensors, the attached wiring harness, and the associated brackets . The brackets are NOT part of the sensor and wiring harness that you buy. If there is just a break in the wires, you can probably just fix the broken wires. Since it's outside, it'd be best to solder, shrink wrap, and then tape the wires. You can probably just use crimp connectors and plenty of tape. Try to keep the wires twisted as much as possible - don't untwist "a lot" in each direction. The wires are twisted to reduce noise interference. In order to check the error codes, I had to first drive up to ~30+mph before the error codes were erased. If you have to replace the rear sensor and attached wiring harness, the hardest part is taking the wheel off and getting the rear seat out (push, no push some more to release the seat, but I can't get a good footing, argg! ... :-). If you have a multi-meter, you can do a simple test of the rear sensor if you get it from the salvage yard. There should be between 800 ohms to 2K ohms of resistance between the two pins on the connector. Actually, it's a different and tighter range for the fronts/backs. But, 800-2K works for both and is a good "ball park" indication that the sensor works. (e.g. maybe, 1200-1800 ohms for the fronts????). To put on a new sensor ring, the axle has to be removed (quick and easy less than 15 mins for the experienced). 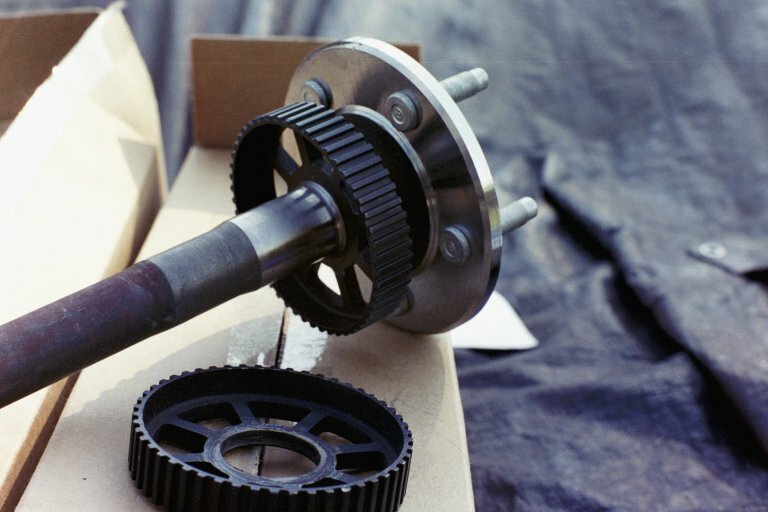 Here is a great article on how to remove the axles. Just pry off the old sensor, and put on the new sensor AT THE CORRECT OFFSET. I learned. :-( See the diagram for the correct offset. To put on the new sensor "it should be put on with a press and NOT hammered/banged/knocked on". The shock can affect the magnetic properties of the sensor. Make sure to add friction modifier back to the gear oil. If you do it yourself, it's $35 sensor, $20 diff fluid, $4 friction modifier, $5 diff gasket. Should be under 1 hour of work for a mechanic. Again, make sure that you have the spec for the correct offset of the sensor. About line locks and ABS... First of all this applies ONLY TO MUSTANGS! Use this info with ANY other system and it's YOUR fault when your brakes fail and you kill yourself. This INFORMATION APPLIES ONLY TO MUSTANGS! You just bleed the brakes normally after installing the line lock. For NON-MUSTANGS, bleed as per FACTORY instructions. There are two types of Mustang ABS systems. 3 output and 4 output. You can tell by the number of brake lines out of the TOP of the controller. The 4 output units have separate brake lines for each of the rear brakes. The 3 output has a single brake line to the rear brakes. With a line lock and doing quarter miles, the ABS light "may not" come on. On a dyno, the ABS (error)light _should_ come on and then go off after normal driving for a few minutes. You do not "have to" remove the ABS fuse. Since the your car was on and moved some distance, the ABS detected that all four signals were "matched for speed". It will take about .2 miles of unmatched speed for the ABS to "throw a code" and shut down. Once you *turn the car off and on* your ABS "should" start to work again immediately. However, it may take some distance travel and another turn-off turn-on for the ABS to once again fully function. However, that may change with newer Mustang ABS systems. Also, I, like many others, have felt the ABS "pulse" on quick brake action on short moves. It would be BAD if the ABS did that for your quarter mile run (just time-wise, not ABS unit-wise). The BEST thing for BOTH situations is to FIRST pull the ABS fuse. Again, for MUSTANGS ONLY! A pulled power fuse is "the same" as if the ABS controller detected an error. The internal relay that provides _power_ to the solenoids (that do the ABS) is not activated. That relay is activated ONLY after the ABS computer goes through self test, system test, and does not detect a "problem" (such as 2 wheels going from 0->40 and two other wheels staying at 0). Again, for MUSTANGS ONLY! Note: The line lock(s) should be on BOTH of the front brakes. For a '94 with stock front brakes, big sticky tires, and modified engine, you will NOT not have enough holding power with just one front wheel. Again, for this is for MUSTANGS ONLY! For t-birds, GM's, foreign, etc. follow the above and you may have your relatives and friends coming to visit you _for that one last time_. For 1999+ Mustangs, with Traction Control, you SHOULD use a bidirectional controller when the ABS controller, MC, or any line between the two the Master Cylinder is replaced or opened. However, NO MUSTANG requires any type of ABS (or ABS/Traction Control) control when just the calipers or soft lines are replaced. Again, for those with traction control, the MC MUST NOT GO DRY. I'm still not exactly sure how Saved Autoparts does this, but I *HIGHLY* recommend them as I saved about $800 (paid $135 + shipping) getting this ABS controller from them! They don't have a web site but their phone # is 920-434-0771. They shipped it when they said they would and it indeed looked brand new & was the exact part for the '98 ABS unit (which is unique). They are based in Green Bay in case anyone is close.